Large quantities of fresh to slightly saline groundwater underlie more than 81 percent of the land in Texas. There are nine “major” aquifers and 20 “minor” aquifers. At present, 56 percent of the State’s annual water consumption is derived from the State’s major and minor aquifers, 75 percent of which is used for agriculture. 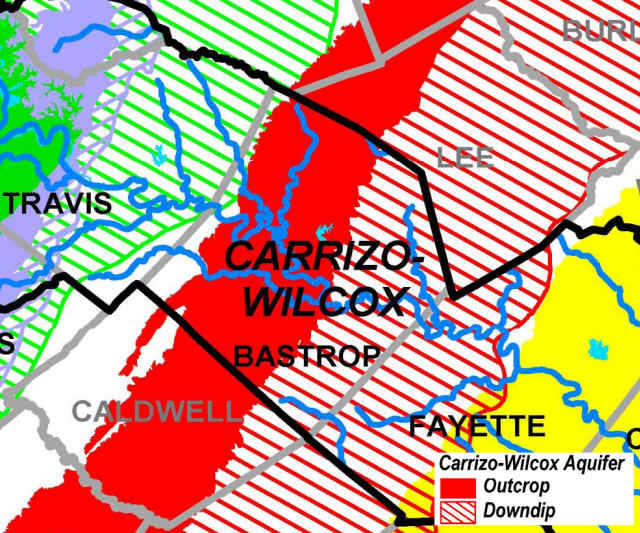 The Carrizo-Wilcox forms the major aquifer in western and central Bastrop and Lee Counties. 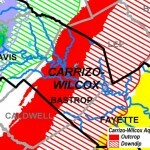 This aquifer contains both water-table and artesian zones and consists of two connected formations, the Wilcox Group and the overlying Carrizo formation. The thickness of the artesian zone ranges from 200 feet to 3,000 feet. The outcrop (recharge zone) region dominates most of the western part of the county and the deeper (downdip) portion runs through the central part of the county. 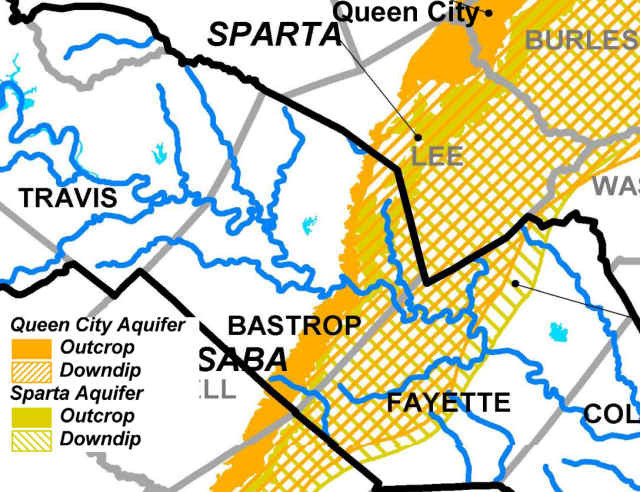 The Queen City and Sparta aquifers overlap one another across southeastern Bastrop (east of Smithville) and northwestern Fayette Counties and East Lee County. The Queen City aquifer has a maximum thickness of less than 500 feet. The Sparta aquifer overlies the downdip portion of the Queen City aquifer. 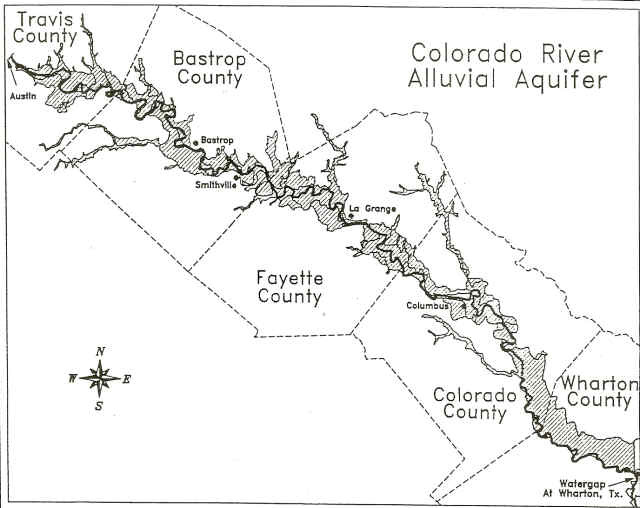 The primary surface water feature of Bastrop County is the Colorado River. A significant source of groundwater for many cities along the river is the Colorado River Alluvium which is an aquifer that is in direct contact with the river and stretches 200 miles from Austin to Wharton, Texas. This alluvial aquifer has water quality characteristics that are similar to the river which is rated as exceptional for aquatic life. 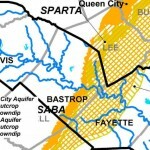 The City of Bastrop draws the majority of its municipal water supply from this alluvial aquifer. However, because the aquifer is not recognized as a minor aquifer this resource is vulnerable to pollution and is not monitored like other designated aquifers. 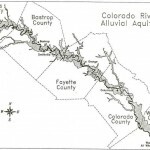 Click here for paper by LCRA scientist proposing recognition of the Colorado River Alluvium as a minor aquifer. Because this aquifer has never been recognized by the Texas Water Development Board as a minor aquifer, it was not included in the GMA-12 desired future conditions. This is creating some concerns since the City of Bastrop has several municipal wells in this aquifer. 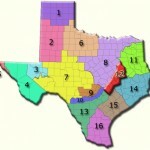 The Lost Pines Groundwater Conservation District (GCD) was created by the Texas Legislature to protect the water supply for the residents of Bastrop and Lee Counties. That is its sole mission. Under Texas law, a water district is the only tool available to protect our groundwater supply. 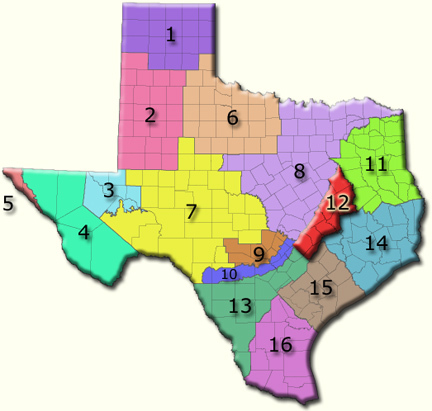 The Lost Pines Groundwater Conservation District is governed locally by ten citizens, (five from each county) who have been appointed by their respective County Commissioners Courts to serve as directors for a term of four years. Their charge is to determine how best to protect the underground aquifer from over pumping so that there will be enough water for everyone, now and in the future”. Recently the Lost Pines GCD was tasked with setting the desired future condition of the aquifers under its care by 2010. This is an important step in planning for water in Texas and Bastrop County for the next 50 years. The desired future conditions provide the foundation for estimating the amount of groundwater available to the region. Five GCD’s (Red on the map), the GMA12, are required to work together to set these conditions for the Carrizo-Wilcox Aquifer. Though the Lost Pines GCD has indicated its desire that the aquifers be managed in a sustainable manner to protect future generations, other GCD’s and groundwater marketers seem to be more interested in “mining” the aquifer. Environmental Stewardship prepared a whitepaper discussing the issues and filed a petition appealing the GMA-12 adopted desired future conditions. Unfortunately, the Carrizo-Wilcox aquifer is very slow to recharge, so it would take generations to recover from excess pumping if we go down that path.